Here’s a radical idea: Let’s think of houses as places where people live. Housing affordability is the big political issue of 2013. Hardly a day passes without the Government, Opposition, commentators or analysts adding their two cents’ worth. What’s good about the debate is the growing consensus that ever-rising house prices are bad. It shouldn’t be such a revolutionary insight. In most markets, we are used to products becoming cheaper and better over time. Why should housing be any different? Perhaps we should think more about houses as homes, not primarily as a financial investment. Now that’s a radical thought. There is nothing more annoying on TV than repeats. Except, perhaps, repeats of repeats. However, as a relative newcomer to New Zealand, I really appreciate TVNZ’s Heartland channel – classic programmes about New Zealand’s recent past. My personal favourites are the 1970s and 1980s beauty pageants and fashion design awards not only because yesteryear’s sense of style looks so hilarious now. 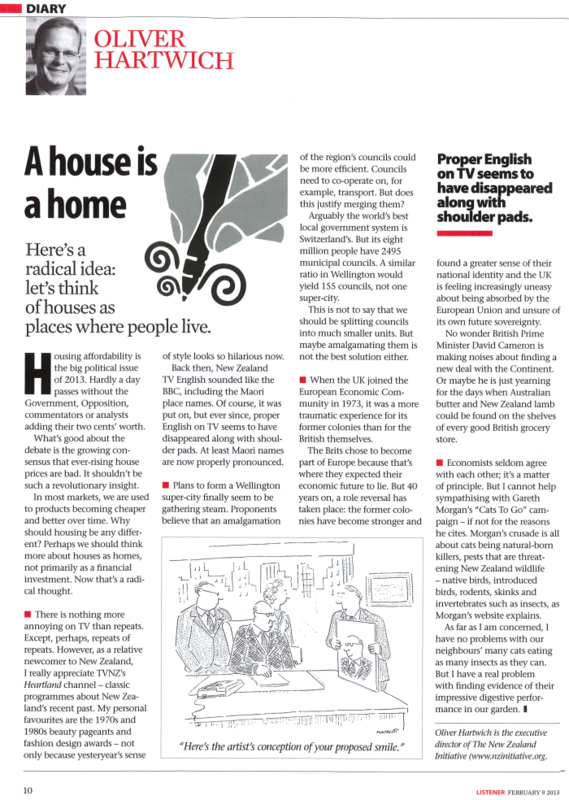 Back then, New Zealand TV English sounded like the BBC, including the Maori place names. Of course, it was put on, but ever since, proper English on TV seems to have disappeared along with shoulder pads. At least Maori names are now properly pronounced. Plans to form a Wellington super-city finally seem to be gathering steam. Proponents believe that an amalgamation of the region’s councils could be more efficient. Councils need to co-operate on, for example, transport. But does this justify merging them? Arguably the world’s best local government system is Switzerland’s. But its eight million people have 2495 municipal councils. A similar ratio in Wellington would yield 155 councils, not one super-city. This is not to say that we should be splitting councils into much smaller units. But maybe amalgamating them is not the best solution either. When the UK joined the European Economic Community in 1973, it was a more traumatic experience for its former colonies than for the British themselves. The Brits chose to become part of Europe because that’s where they expected their economic future to lie. But 40 years on, a role reversal has taken place: the former colonies have become stronger and found a greater sense of their national identity and the UK is feeling increasingly uneasy about being absorbed by the European Union and unsure of its own future sovereignty. No wonder British Prime Minister David Cameron is making noises about finding a new deal with the Continent. Or maybe he is just yearning for the days when Australian butter and New Zealand lamb could be found on the shelves of every good British grocery store. Economists seldom agree with each other; it’s a matter of principle. But I cannot help sympathising with Gareth Morgan’s ”Cats To Go” campaign if not for the reasons he cites. Morgan’s crusade is all about cats being natural-born killers, pests that are threatening New Zealand wildlife native birds, introduced birds, rodents, skinks and invertebrates such as insects, as Morgan’s website explains. As far as I am concerned, I have no problems with our neighbours’ many cats eating as many insects as they can. But I have a real problem with finding evidence of their impressive digestive performance in our garden. Oliver Hartwich is the executive director of The New Zealand Initiative (www.nzinitiative.org.nz).